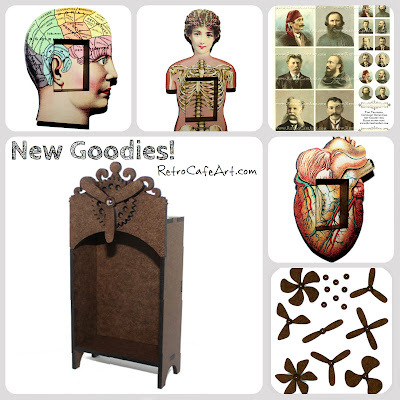 New Anatomy Shrine Kits and Curiosities! Happy Friday to you all! We have some wonderfully unique NEW items for you this week! 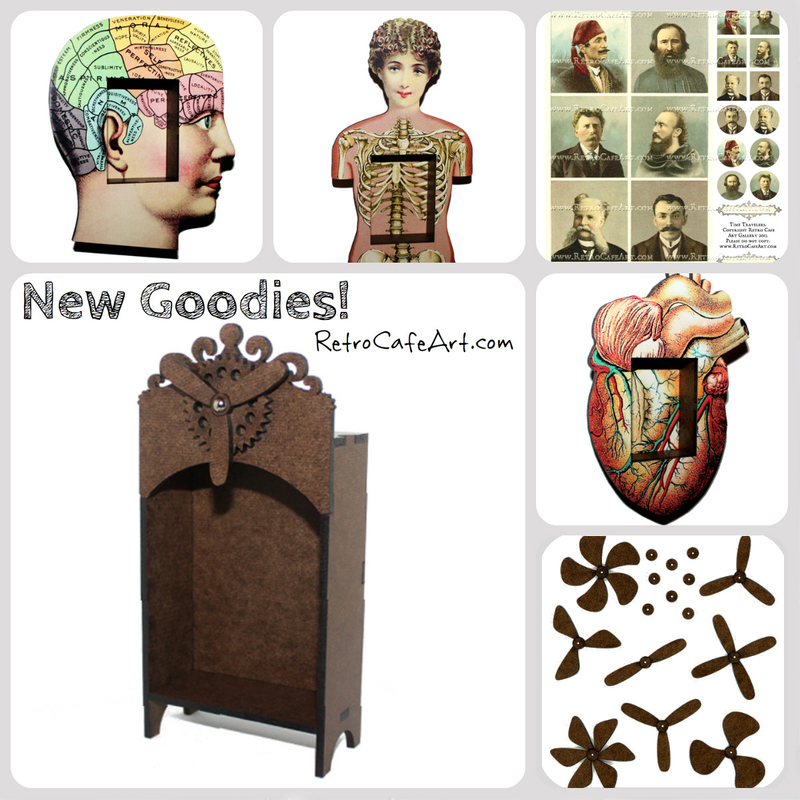 Anatomy Shrine Kits, a new Steampunk ATC Hutch Shrine Kit, tons of Curious Collage Sheets, and even some Vintage Teeth Models (yep). We're celebrating all things odd and awesome! Speaking of odd, how about some curious Cabinet Cards? These were really fun to create and I definitely have to give tons of inspirational credit and a shout out to my good friend Denise Phillips. Her latest creations certainly had an influence! So of course I jumped right in and started creating with our new goodies. 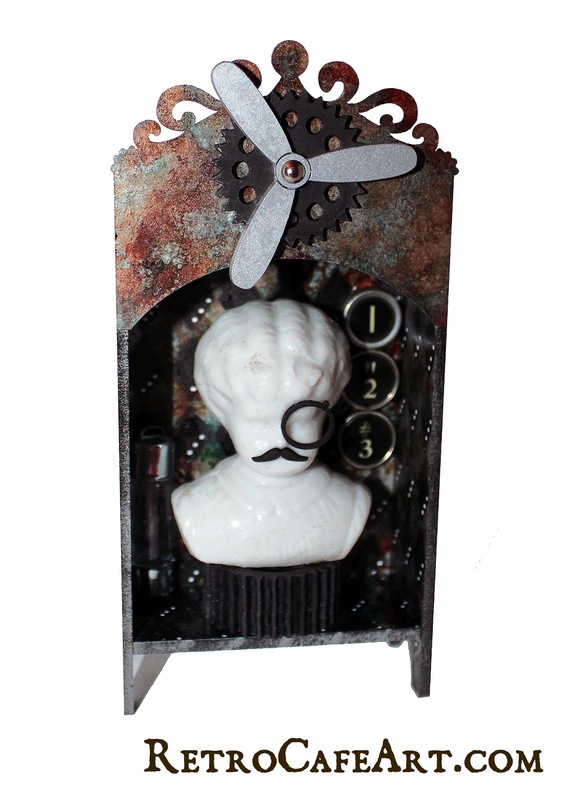 First, the new Steampunk ATC Hutch Shrine. 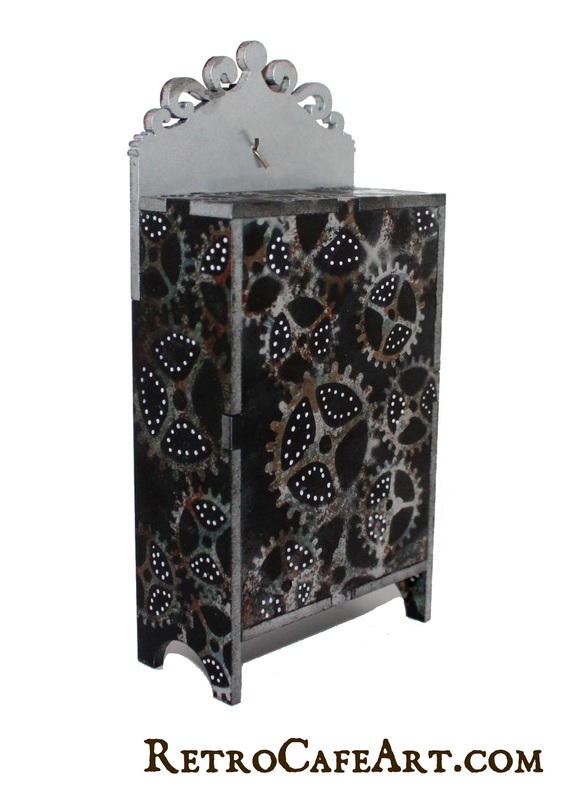 I created the pattern on the outside by first spraying my pieces with silver spray paint. Next I placed stencil board gears over my pieces using them as a mask and sprayed the pieces with black spray paint. Once dry I added some alcohol inks and white paint marker accents. 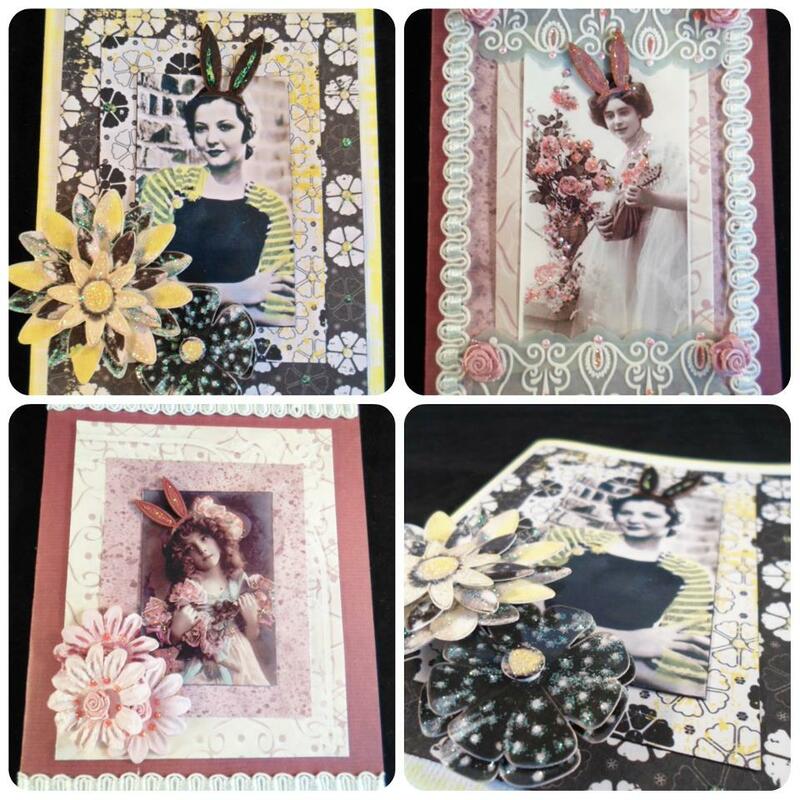 I also had lots of fun making these ATCs using several of the new goodies! I especially love the new propellers. So many uses for those! 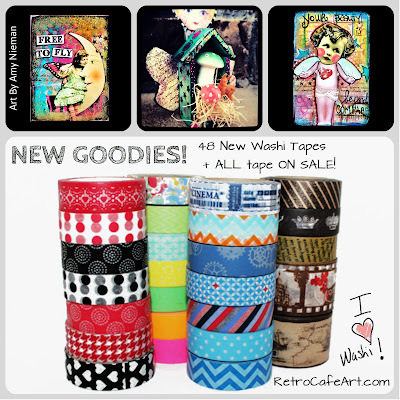 NEW Washi Tapes + a SALE! TGIF Everyone! We have 48 BRAND NEW Washi Tapes in the shop PLUS all Washi Tape is on sale through Monday! 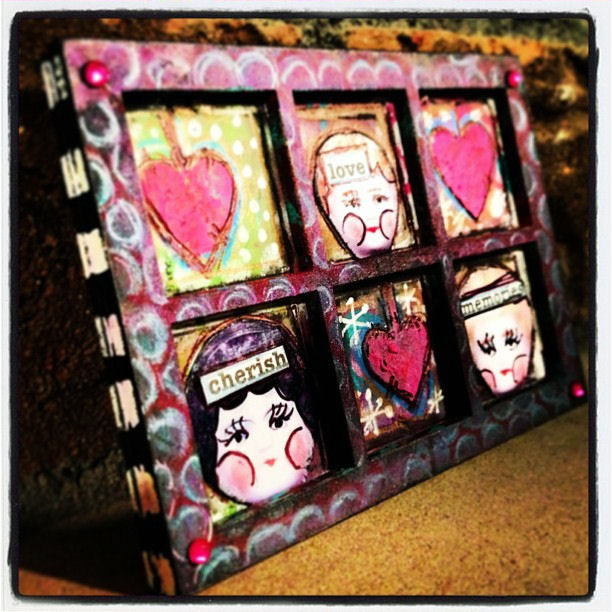 The sweet Washi Tape Art Samples above are by Design Team Member Amy Nieman. Don't they just make you want to play with your art supplies? Right now? Washi Tape is so versatile and it's not just for 2D art! It works great on the sides of our shrines and in particular the Mini House Shrine Kits! This awesome gem is by Design Team Member Linda Cain. Note the Washi Tape on the sides! Visit Linda's blog for a complete tutorial! NEW Tim Holtz Idea-ology and MORE! Happy Friday everyone! 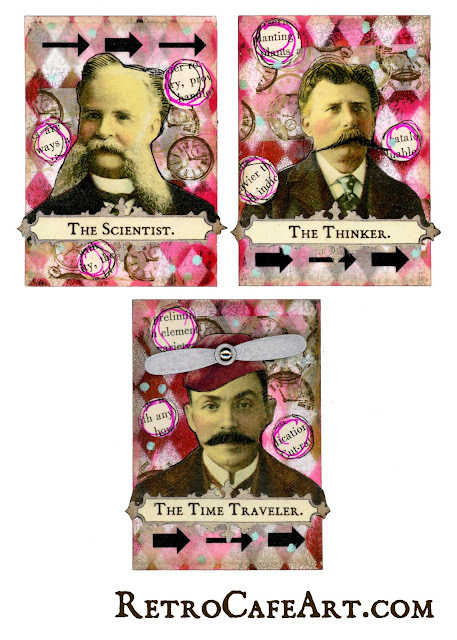 We have ALL of the NEW Tim Holtz Idea-ology in stock and ready for you! But hurry, several of the items are limited stock. 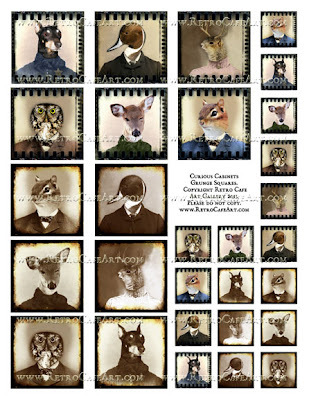 We also have several Happy Sunny Collage Sheets to get you ready for the summer and more! We love how so many of the Idea-ology products can be used so beautifully with our Shrine Kits. 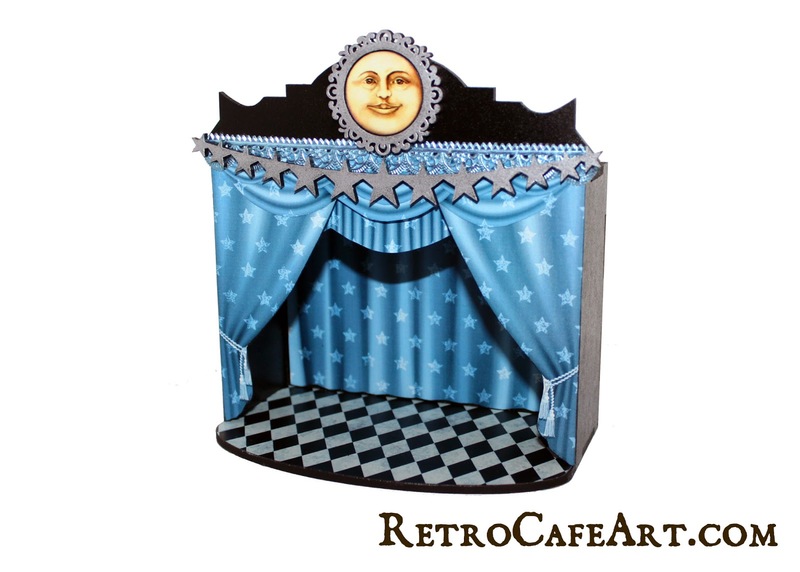 This gorgeous Circus Theatre Shrine by Design Team Member Linda Cain proves it! You can find more info about Linda's Theatre on her blog post. 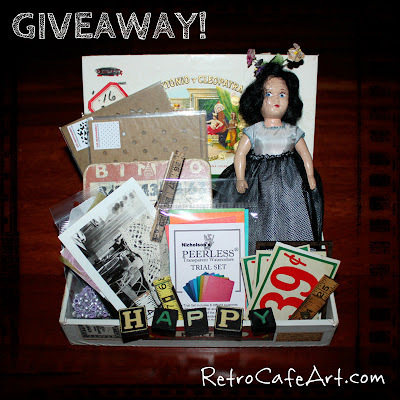 You still have plenty of time to join in the Mini House Shrine Swap! I've seen a few samples popping up already here and there and let me tell you they are fabulous. You don't want to miss this one! You can jump to the Swap Page for more details. 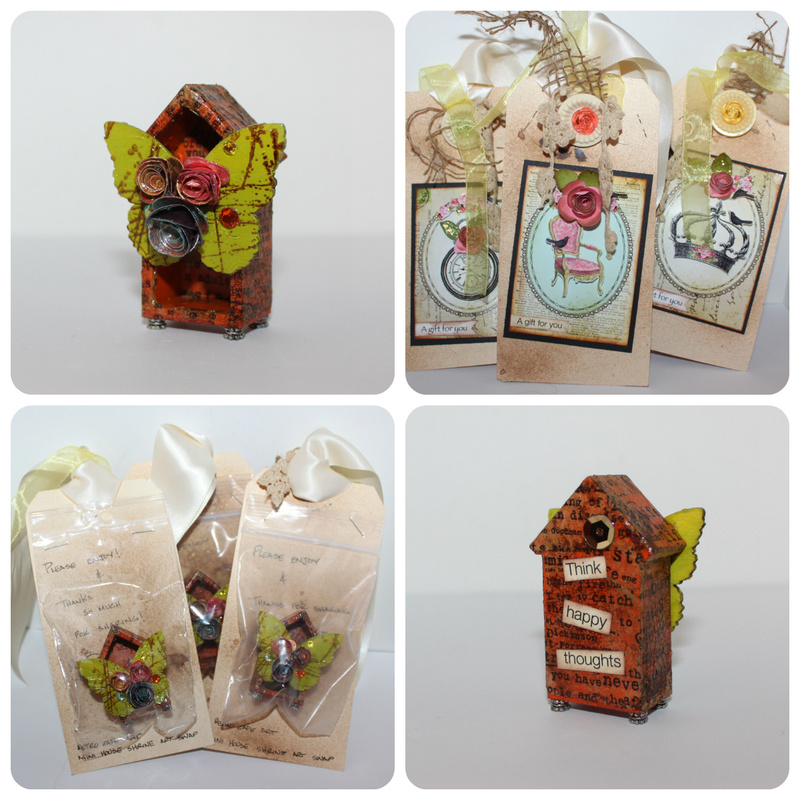 The gorgeous house above were created by the talented Luci Brito for the swap! 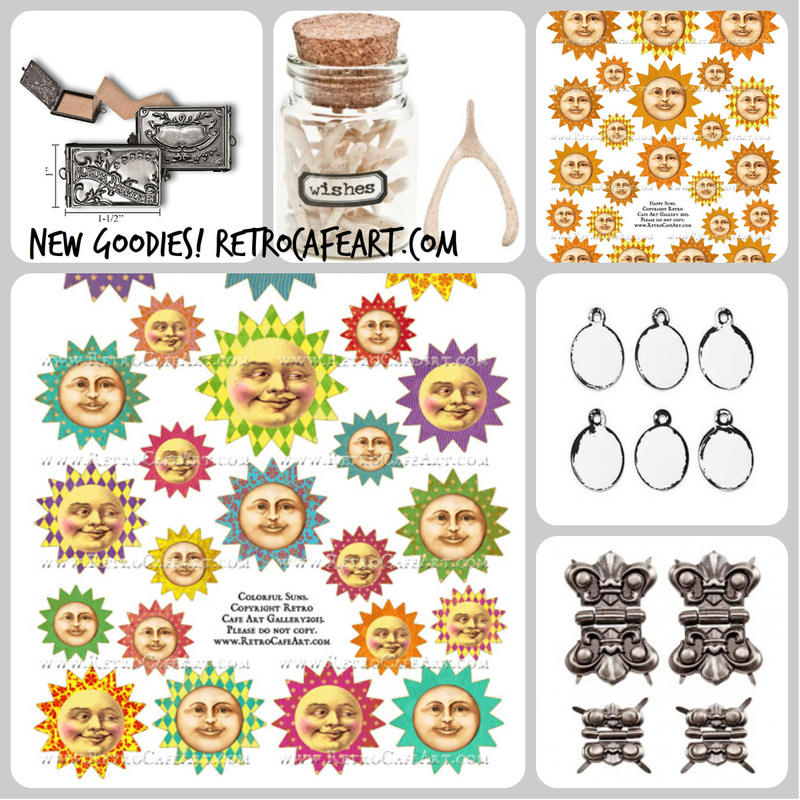 New Goodies That Are Over The Moon! Happy Friday! 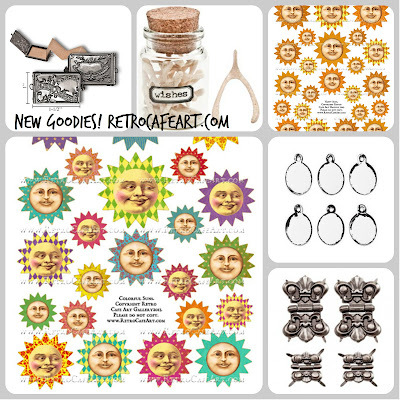 It's time for some New Goodies that will have you shooting for the moon! A few weeks ago we released a Hand, Moon, and Star Shrine Kit, and this week we have them in even smaller sizes! Not to mention a fabulous new addition to our Medium Theatre Shrine Kits and several awesome Collage Sheets. And more of course! Supplies: Moon Theatre Shrine Kit, Blue Moon Curtains Collage Sheet, Over The Moon Collage Sheet (paper moon girl), German Dresden Aqua Fancy Scalloped Border, and Silver Gilders Paste. Also Black Spray Paint and Black Archival Ink. I happened to look down and noticed the new Over The Moon Collage Sheet sitting on the art table and was drawn to the sweet girl. I adore paper moon photos and turns out she was the perfect size. 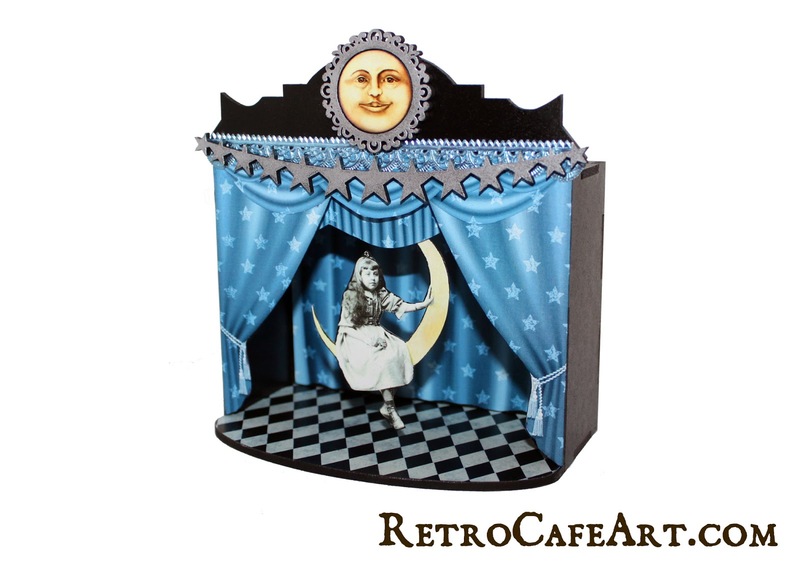 I simply did a fussy cut and then attached her to the top of the curtain so she is suspended, just like a real paper moon photo shoot! I also tinted the moon with a yellow colored pencil. 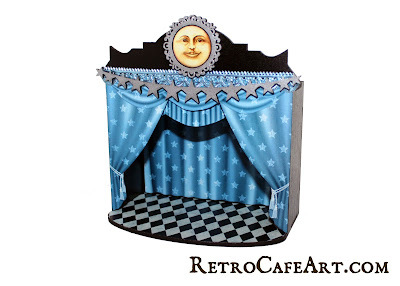 I may add more later, but for now I love my little paper moon photo booth! Road Trip Fun, Design Team Art, + a GIVEAWAY! Hi everyone! Last week I went on a fantastic road trip from Indiana, to Minnesota, to Iowa, and back again! I had a great time and thought I would share some of my photos with you since much of my trip included two of my favorite things (and likely yours), Art + Antiques! Many of you have seen me post the wonderful art of Diana Darden, well on my trip I had the pleasure of meeting Diana! She has the most fantastic studio (pictured above) and is very prolific in her work as you can see. 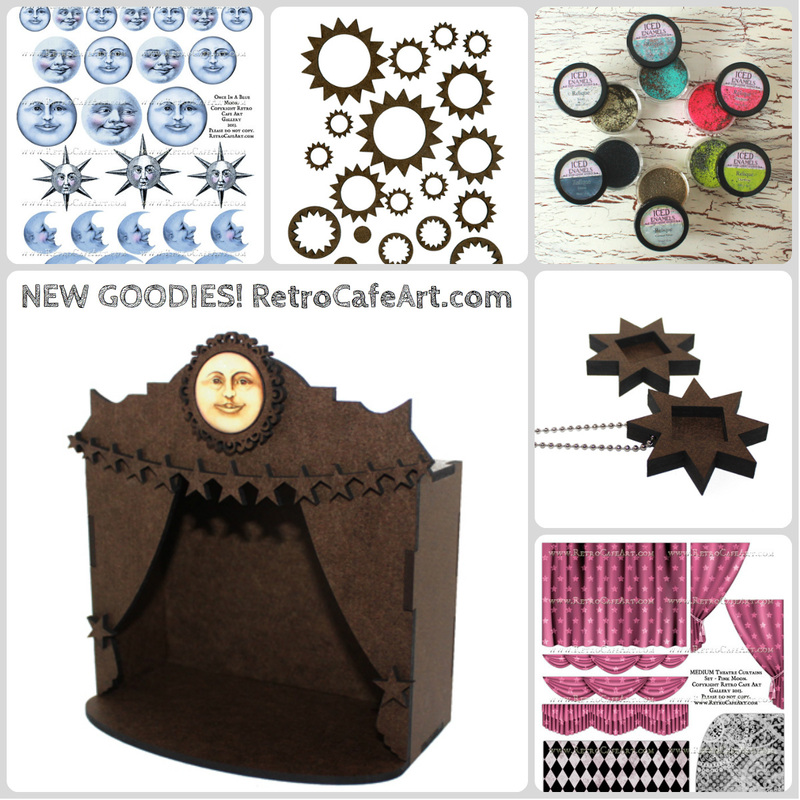 Her work is fantastic and she does amazing things with our Coffee Break Design Shrine Kits! Diana sells her work in several galleries, such as Three Rooms pictured above. Her Male and Female Articulated Art Doll Shrine Kits are so cool! Diana has a Facebook Fan Page where she often posts her work. Go like her page and you won't be sorry! Maybe it was the lack of sleep, maybe it was the sugar and caffeine, but Diana and I had a blast in the short time I was visiting! Thanks to Yelp and my iPhone navigation, I was able to hit several antique stores on the road, 10+. My favorite was definitely Hunt and Gather in Minneapolis. This store is a mixed media artist's dream come true. Bins and bins of treasures, just waiting to be picked! How often do you seen this? Not often enough in my opinion! Now not to worry, I didn't forget about you. While I was away I planned to buy up some things for our weekly Random Wednesday giveaway on Facebook! Several of the included items came from Hunt and Gather and others from the many antique stores I visited. I also added in several other goodies from the shop. I'm a huge fan of mixing antique and modern supplies. So here it is, this week's Random Wednesday Giveaway! And yes, you even get the cigar box! Everything you see below and several things you don't see! Go leave a comment on the Random Wednesday post on Facebook (the post with the same photo above) for a chance to win! You have until Saturday when a winner is drawn! 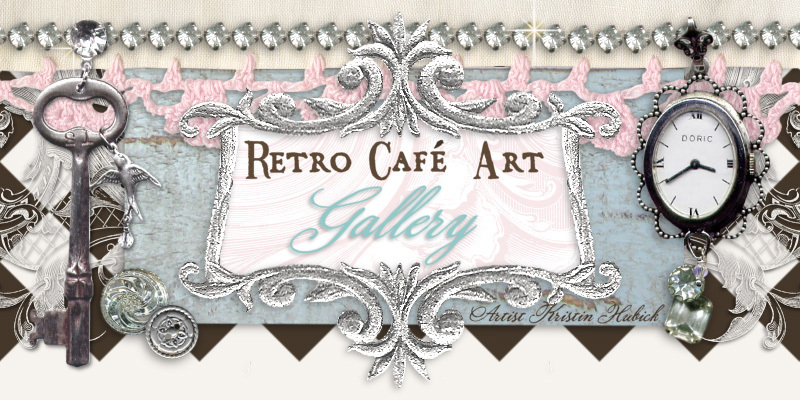 Now, how about some eye candy from the awesome Retro Cafe Art Gallery Design Team! Gerri Herbst created these beautiful cards using our Bunny Ear Cut-Outs as well as our Roses Roses and Screen Siren Collage Sheets. These sweet cards are sure to make anyone smile! 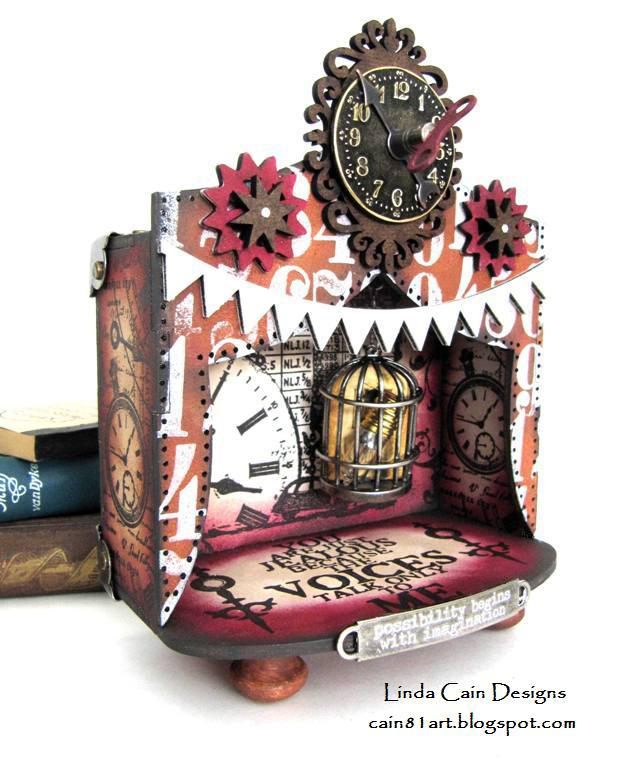 Linda Cain created this stunning piece using the Medium Circus Theatre Shrine Kit, Steampunk Gears II, Star Cut-Outs, Large Oval Cameo Frame, and several Idea-ology Embellishements. I would love to see the show that would take place in this theatre! Amy Nieman created this awesome work of art using the 6 Pane ATC Window, Hello Dollie Collage Sheet, and Falling Heart Border Stencil. 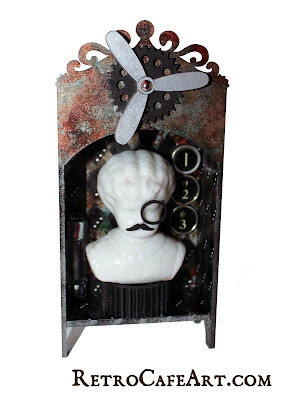 This wonderfully whimsical piece makes me so happy! Lynn Stevens created this darling Mini House Shrine using the Mini House Shrine Kit, Small Frozen Charlotte, and a Fleur Brass Crown. 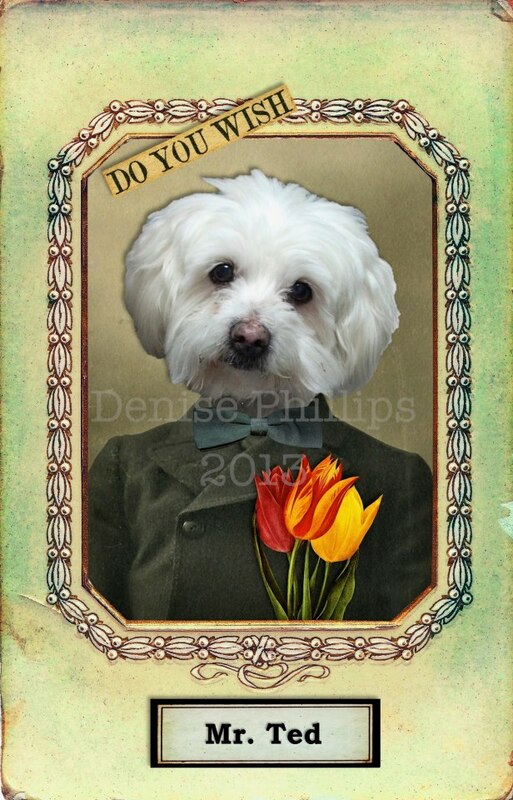 Lynn created this for the Mini House Shrine Art Swap happening right now. 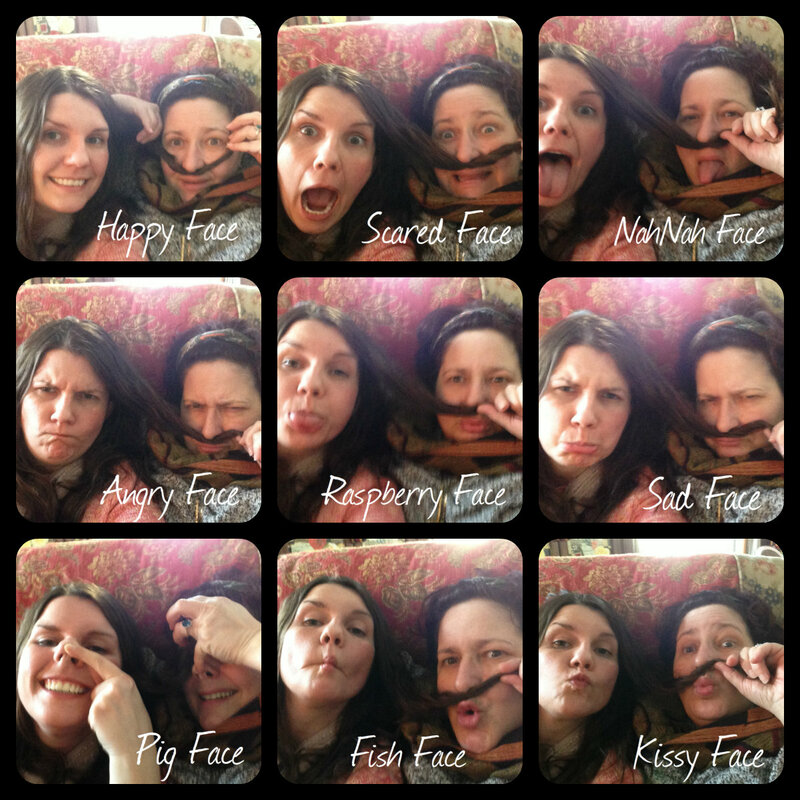 You still have time to play in the swap! Thanks for the inspiration Lynn!